I am an avid podcast listener, and recently i came across a show called, “Everything Is Alive.” If you haven’t heard of it, I highly recommend checking it out. Basically, the creator of this podcast realized that certain everyday items have a LOT to talk about. Inspired by this, I decided to see what things around the Center may have an opinion or story to tell. So, despite the looks of my co-workers, I walked around the Center saying, “Hello! Does anything want to talk to me?” It took several tries before things either were brave enough to talk to me or thought I was worth talking to. But my first conversation was with a can of corn that I met on the shelf of our workroom, who spoke up. JM: Hello, um, Mr. Corn—or how should I call you? Corn: I am good with Corn. Just Corn. JM: Well, thank you Corn for speaking with me. May I ask how you are doing today? C: You are welcome. I’m doing good, glad to be here and talking to you. JM: Good. This is a little weird, though. Have you ever talked to someone? JM: Well, I’m glad we are talking now. So, how do you feel about being on a shelf in a food pantry? Did you know you were in a food pantry? C: Good. I’m good with it, you know. I am food and let’s face it, cans of corn don’t have a lot to strive for. So being a part of something bigger than, you know, the average pantry is only something a can, can dream of. I did know. I am thankful for the person who bought me and some of other cans at the store and brought me here. It can be a little disorienting, you know, being thrown around and tossed in a grocery bag, but once someone put me on this shelf I got my bearings. JM: What was it like before you came to this shelf? Do you see lots of people? What did you do all day? 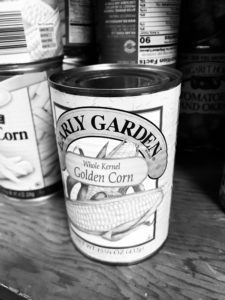 C: Before I came to be here, I was sitting on a shelf in the store with lots of other cans of corn—basic, unsalted, creamed, Mexican, you know, all sorts. I would sit on the shelf and sit as straight as possible, hoping I would be the next one chosen— but of course it really is a lot of luck when someone grabs you. So I sat on the shelf thinking of the day someone would buy me. I have an expiration date, you know, and I didn’t want to get close to that date before someone bought me. JM: So are you close to your expiration? JM: What have you heard? JM: So not being eaten bothers you? Wait, do you read books? C: Well, the cleaning guy at the store listened to books and I got to hear parts of The Giver. I enjoyed it… maybe you could play some books for us in this room? And yes, being eaten is the whole reason for my existence — to provide sustenance to humans. JM: I’ll see what I can do about entertainment for you in the workroom… What do you say to people who say you are not a vegetable? C: Yeah, I hear that a lot. Green Beans like to tell me that all the time. But my answer is— what is a vegetable? Something that grows from a plant? I am. Can you grow corn in a garden or farm? Yes. Does sunshine help corn grow? Yes. JM: You seem pretty passionate about this. C: Absolutely! Saying that corn isn’t a vegetable—has too many carbohydrates to be healthy or that I am not as healthy as say, a pea, is insulting me and my brothers and sisters in corn. JM: What do you see on a daily basis here at the Center? C: People. Mainly the same people though. They seem really busy. Coming and going, gathering food and other stuff in a box and load it on a cart. Then they take it out of the room I’m in and sometimes before the door closes I see the box handed to someone else. JM: How does that make you feel? C: Well. Like I said before, it makes me excited and anxious. I want to be picked next and be part of something bigger. Feeding people is what I do and what I live for. I am impressed with the things I see. C: Well, in this place there is a list I see the workers using to pick food from. I heard them talking about it. It is a list that the people who come in for food choose from. I think that is kinda cool, so now hungry people can choose what they want to eat. It is my understanding that people used to be handed a packed box of stuff and lots was wasted. No food wants to be wasted. JM: What do you want the general public to know? C: Ummm… I’d like everyone to know that it is important to not only eat your vegetables but to spend time with one another. To summarize the words of Jacques Pepin: Family is about one another, sitting around the table at night. And it’s very, very important for the kids to spend time not only around the table eating with their parents, but in the kitchen. JM: Well said, well said Corn. Those are some great words of wisdom. Thank you for talking with me today, I really appreciate it. So that was my conversation with a can of corn. It sounds crazy, I know, but we all sometimes think we hear something… or someone saying something—so just maybe, maybe that is someTHING trying to say, “Hi” to you. Start Saving for Christmas Now!